Before people begin thinking that I really have the lack of taste that I display in this blog, here is one of my all favourite records. 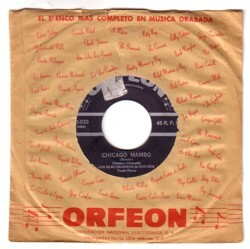 It is a 45 by Los Electronicos De Don Gus and they play the ”Chicago mambo” . I am great fan of obscure up tempo mambos with sound effects, non traditional instruments and western influences, recorded in the 60’s. This record was released on Orfeon, a Mexican label. I don’t know anything about Don Gus and his electronic band members, and I hesitate to do a Google search. It might be that they have released five LP’s with equal great material, but I am more afraid that this wild mambostomper was their only claim to fame. It would not be the first time that a favourite record of mine was degraded because the artist later added some (much) less exciting recordings to his catalogue and my collection. And, before I get questions about it: the B-side is a Mexican (!) version of “The Blob” , a 60’s hit in The States for The Five Blobs. In Mexican it is called “La Burbuja” .